In a perfect world we’d all be heading somewhere warm to enjoy life on a beach for a few weeks during the summer, but the reality is that this just isn’t plausible for many people. 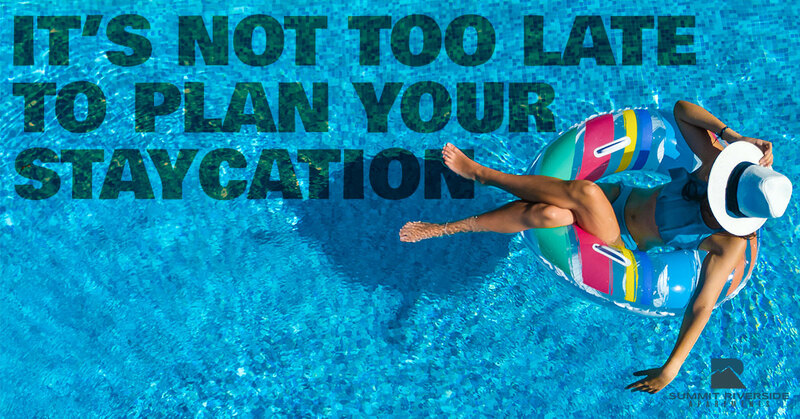 That doesn’t mean that you can’t have the time of your life on a staycation though! At Summit Riverside Apartments in Littleton our goal is to offer a living space that’s cozy enough that you don’t have to go too far to have the time of your life. If you’re the type of person who could use a little staycation, then today’s post is for you. What can you do while you’re taking it easy without straying too far from home? As a matter of fact, we have a couple of suggestions for you. Keep reading to learn more! As the go-to luxury apartments in Littleton, we offer an outdoor heated saltwater pool. If that sounds like the perfect place to go for a swim that’s because it totally is. When you’re trying to relax, there’s nothing better than spending some time in the water. Whether that means swimming some laps and working up a sweat or just taking it easy and dipping your toes in the pool, this is the place to do it. The pool is also right by our barbecue grills. What that means is that you can enjoy some time at the pool and then throw a few burgers on the grill. When it comes to relaxing, it really doesn’t get much better than that! We’ve written about great restaurants in our neck of the woods in the past, but when you’re enjoying a staycation, it’s the perfect opportunity to enjoy good food every single day. Go out for breakfast, grab a sandwich for lunch, and treat yourself to a good steak in the evening. Littleton is full of amazing places to eat and now is the ideal time to try a number of them, don’t you think? Or, of course, you could also make it a point to try out a few recipes on your own. The kitchens in our apartments contain stainless steel appliances, designer flooring, dark wood cabinets, and amazing layouts which makes them the perfect place to experiment with your own culinary creations or try out new recipes that you might not otherwise have time for. The whole point of a staycation is to enjoy yourself without having to stray too far to do it. The benefit of this is that you don’t have to get a ride to the airport, spend five hours on a plane next to a screaming kid, and then figure out how to rent a car and get around an unfamiliar area. When you’re staying close to home, you can take your own car wherever you’d like. Or you can vow not to use your car at all. If your goal is to never stray too far from your living space, the best way to prepare is by renting movies or buying books to keep you entertained throughout the duration of your staycation. Take the opportunity to catch up on all of the things you have missed out on, and most importantly, just focus on relaxing. Want to Live in Our Luxury Apartments? If you’re planning a staycation and you’d like to make your home in our luxury apartments, we’d love to show you around. Schedule a tour today and see for yourself what makes Summit Riverside Apartments in Littleton such a great place to live.